Situated between the Ionian Sea and the slopes of Mount Etna, Sicily’s second city (a UNESCO World Heritage site) has always had a close relationship with the volcano, and most of the city’s buildings are made from black lava. According to the historian Thucydides , the city was founded in 729 BC by Greek colonists from Chalcis (see p156). Since then it has been flooded with lava and shaken by earthquakes, most radically in 1693, when it was razed to the ground. Catania today is the result of 18th-century rebuilding: broad, straight streets and large, unevenly shaped squares, a precaution against earthquakes. This is the largest private palazzo in 18th-century Catania. Construction begun by Prince Paternò Castello on an embankment of the 16th-century city walls. Work continued for nearly a century and involved some of the leading architects of the time. The most interesting side of the building faces Via Dusmet, with a large terrace decorated with putti, telamons and garlands sculpted by Antonino Amato. The building is partly private and partly used as city administrative offices. 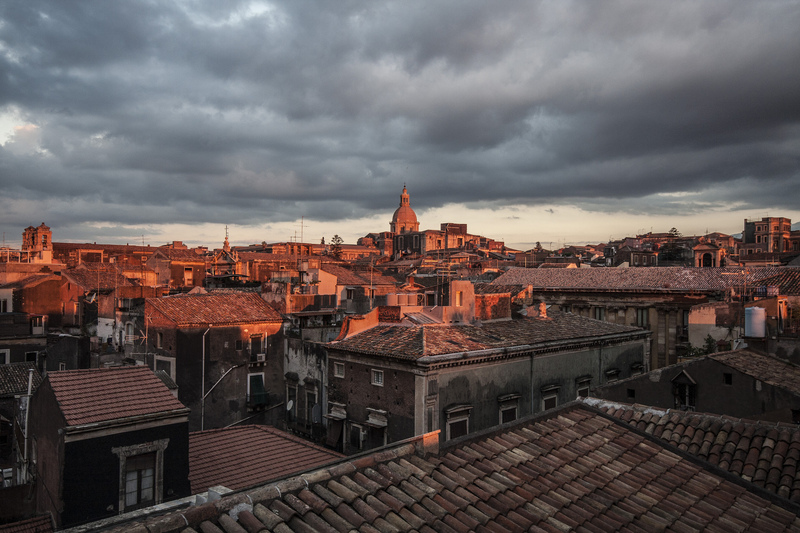 The heart of city life lies at the crossing of Via Etnea and Via Vittorio Emanuele. The square boasts many fine Baroque buildings: Palazzo del Municipio (the Town Hall), the former Chierici Seminary, the Cathedral and Porta Uzeda, the city gate built in 1696 to connect Via Etnea with the port area. In the middle is the Fontana dell’Elefante , a well-known fountain sculpted in 1736 by Giovanni Battista Vaccarini. On a pedestal in the basin is an elephant mad of lava, on the back of which is an Egyptian obelisk. 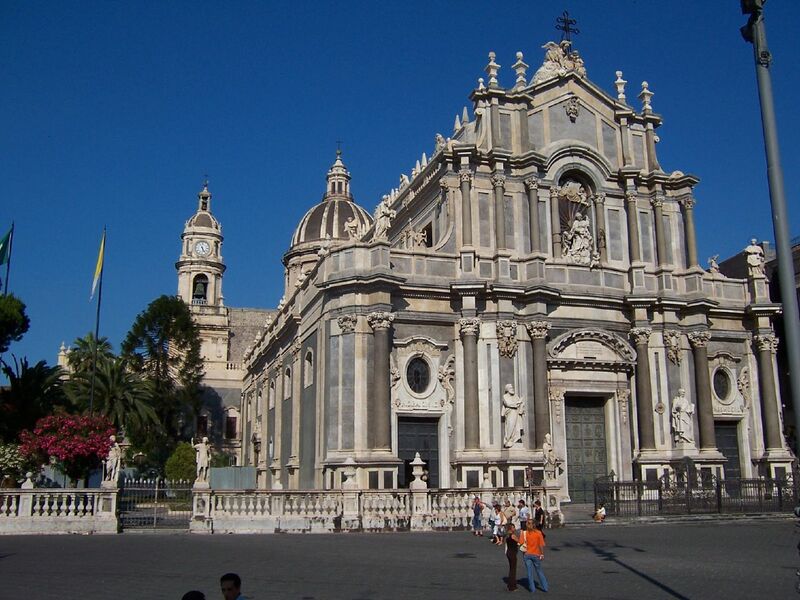 The principal church in Catania is dedicated to the city’s patron saint, Sant’Agata. It still has its three original Norman apses and transept. The façade, with two tiers of columns, is fully Baroque thanks to the design of GB Vaccarini, who also designed the left-hand side of the Cathedral. The majestic interior has a cupola, a tall transept and three apses with lovely columns. On the second pilaster to the right is the Tomb of Vincenzo Bellini; on the first one to the left, a 15th-century stoup. A door in the right-hand transept leads to the Norman Cappella della Madonna, with the remains of various Aragonese rulers. This masterpiece of Catanian Baroque architecture was built in 1735–67 and designed by Giovanni Battista Vaccarini. The façade is a play of convex and concave surfaces. The octagonal interior, a triumph of Rococo decoration, is equally impressive. This construction is now a museum with mementos, autographed scores, musical instruments and models of scenes from some of his operas. Named after the Catania-born composer Vincenzo Bellini, this theatre attracts praise from both critics and the public for its high-quality performances. Situated at the beginning of Via Garibaldi, the Fontana dell’Amenano fountain is fed by the waters of the underground Amenano river, which also forms a pool in the Roman theatre. Sculpted in 1867, the fountain is the focal point of a colourful fish market, the Mercato della Pescheria, which occupies the nearby streets and small squares every morning. The smells and atmosphere of the market are reminiscent of North Africa and the Middle East. At the end of Via Garibaldi is the monumental Porta Garibaldi city gate, built of limestone and lava in 1768 to celebrate the wedding of Ferdinand IV of Sicily. This street is lined with lavishly decorated Baroque palazzi and churches. The road begins at Piazza San Francesco, with the Baroque San Francesco d’Assisi. In the interior are the so-called candelore, carved and gilded wooden constructions which symbolize the various artisans’ guilds in the city. Every February the candelore are carried in procession as part of the impressive celebrations honouring Sant’Agata, the city’s patron saint. Outside the church is the Arco di San Benedetto, an arch connecting the fine Badia Grande abbey, designed by Francesco Battaglia, and the Badia Piccola, attributed to Giovanni Battista Vaccarini. To the left is San Benedetto, where the wooden portal carries scenes of the life of St Benedict, and San Francesco Borgia, at the top of a double flight of steps flanked by the former Jesuit College. Opposite stands San Giuliano, a masterpiece of Catanian Baroque architecture designed by Vaccarini. Built of limestone and lava on the southern slope of the acropolis, the theatre had a diameter of 87 m (285 ft) and could seat 7,000 people. Although there was probably a Greek theatre on this site once, the present ruins are all Roman. The theatre was badly damaged in the 11th century, when Roger I authorized the removal of the marble facing and limestone blocks for use as building material for the cathedral. What remains of the theatre today are the cavea, the edge of the orchestra and part of the backstage area of the theatre. Next to the theatre is the small semicircular Odeion, made of lava and used mainly for competitions in music and rhetoric. It had a seating capacity of 1,500. The entrance to the Odeion is near the top tiers of seats in the Roman theatre. This castle (currently closed for restoration) was built in 1239–50 by Riccardo da Lentini for Frederick II and is one of the few vestiges of medieval Catania. The Castello Ursino originally stood on a promontory overlooking the sea and was part of a massive defence system that once included the Motta, Anastasia, Paternò and Adrano castles. Castello Ursino is square, with four corner towers, and was rebuilt in the mid-1500s. On the eastern side of its exterior, above a large window, a five-pointed star with a cabalistic meaning is visible. In a niche on the façade, the Swabian eagle seizing a lamb with its claws is the symbol of Hohenstaufen imperial power. In the inner courtyard, where the kings of Aragon administered justice, there is a display of sarcophagi, columns and other pieces. The upper rooms house the interesting Museo Civico, which has a fine art gallery with important works such as "The Last Judgement" by Beato Angelico , "The Last Supper" by the Spanish painter Luis de Morales, "St John the Baptist" by Pietro Novelli (see p23) and a dismantled polyptych by Antonello Saliba of the Madonna and Child taken from Santa Maria del Gesù. Catania’s main street goes up a slight incline and connects the most important parts of the city. Partly closed to traffic, Via Etnea has the most elegant shops and cafés in town. Halfway along it lies Piazza Stesicoro, with the ruins of the Roman amphitheatre, built in the 2nd century AD. Near- by is the vast Piazza Carlo Alberto, where a bustling antiques market is held every Sunday morning. Back on Via Etnea is the Collegiata, a chapel built in the early 1700s and one of the most important late Baroque works in the city. The concave façade, designed by Stefano Ittar, is enlivened by columns, statues and niches. Near the end of Via Etnea is the Villa Bellini, a public garden with subtropical plants and busts of famous Sicilians. Catania-Fontanarossa Airport 2 (IATA: CTA) with scheduled and charter planes arriving from destinations throughout Italy and Europe. From the airport, there are half-hourly buses to Catania's bus station. The trip takes about 20 minutes. Frequent buses run to Taormina, Messina, Enna, Caltanissetta, Ragusa and Syracuse. Less frequent buses run to local destinations, Naples, Rome etc. The main bus station is opposite the railway station and 10 minutes walk from the city centre. Frequent trains run up the east coast to and from Taormina (but the station in Taormina is a long walk below the town, at Giardini Naxos better to take the Bus) and Messina, then on to Naples and Rome etc. Trains also run to Enna, Palermo (slower than the buses) and Syracuse. A scenic route runs inland to Caltagirone and Gela. There is one daily train to Agrigento. The railway station is 10 minutes walk from the city centre. Several Ferries run from mainland Italy to Catania. There is an overnight car ferry that runs daily between Naples and Catania as well as ones from Genoa and Civitavecchia. One can also get a ferry to/from Valletta, Malta. Catania is proud of some specialities, like Arancino (cone-shaped rice croquette filled with meat, tomato sauce, cheese and peas) and other many typical tavola calda. 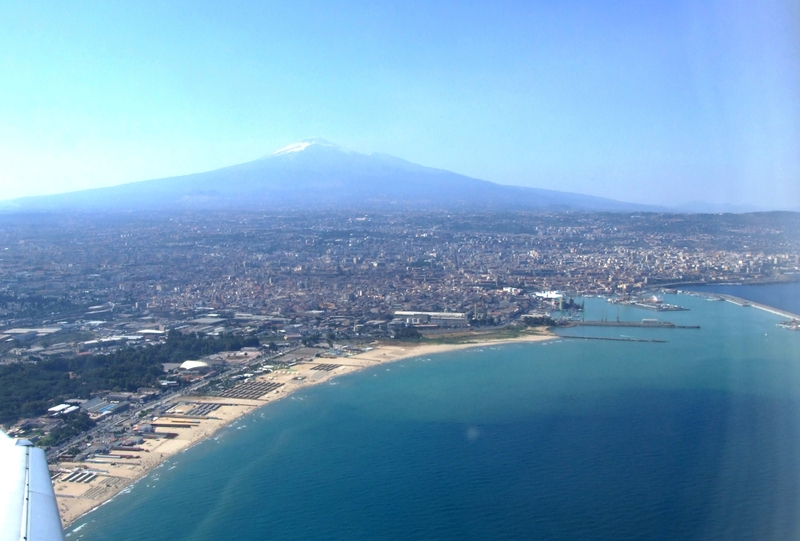 The fish is also good, as Catania is a large port. The city is also known for horse meat, especially in some areas around the "Benedictine Monastery". Another famous speciality is Pasta alla Norma which consists in pasta (generally macaroni) dressed with tomato sauce and topped with fried eggplant slices, grated ricotta salata and fresh basil. Catanese pastry include the world-wide famous Cannolo alla Ricotta, the "Cassatella di Sant'Agata" (a small cassata) and the "Pasta di Mandorla" (based on almond meal). In summer, the typical breakfast consists in "Granita" (a kind of sorbet of almond or black mulberry) served with a sweet round loaf ("brioscia"): it is a nourishing and refreshing combination that can be found in almost any bar of the city. Sicilia in bocca, Via Beato Cardinale G.B. Dusmet, 35. To try typical Sicilian food and pizza. Beware that there are in fact two restaurants called Sicilia in Bocca. The second one has very poor food quality, long waits, smoky outside section, and bad attitude towards foreigners (along with a different menu). 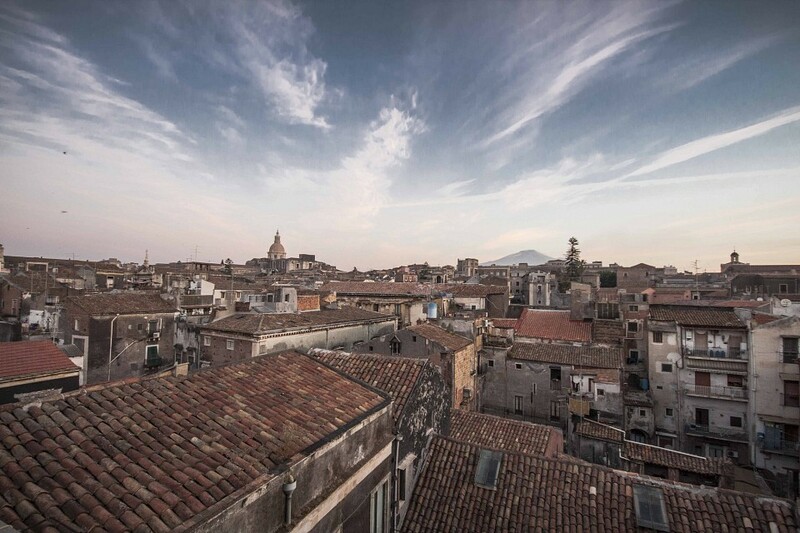 When going to Sicilia in Bocca by taxi, be sure to specify the address. In the proximity of Ursino Castle, there is a good selection of restaurants. Good food quality and decent prices. Camelot is great for the meat lover, Roxy has standard Sicilian/Italian food for a decent price with friendly staff. L'Angolo della Chef, 77 Via Plebiscito.. Traditional Sicilian dishes from Caponata to Polli alla brace. Not for the posh, but great for lovers of street food. City Lounge B&B, Via Gagliani 13. Situated right in the historic centre, in a building typical of the 1800s, the city lounge is an open and sunny place to call home. 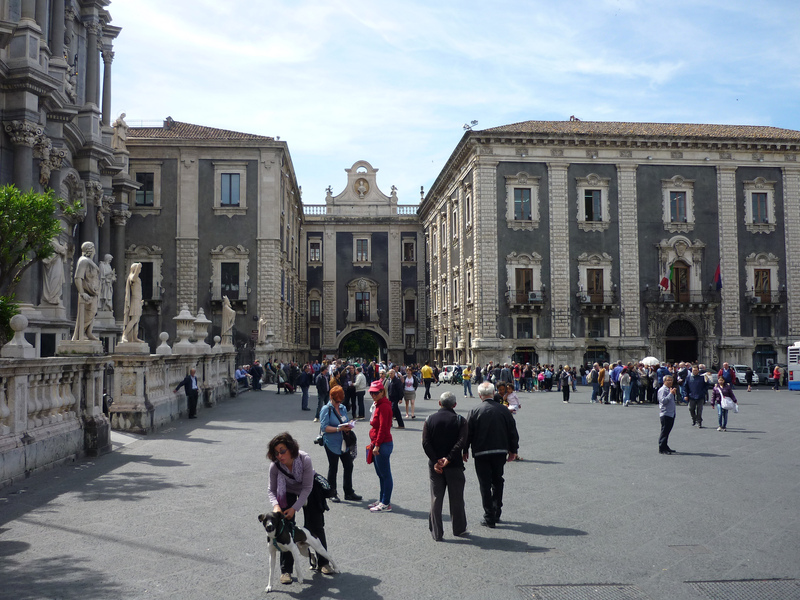 A two minute walk to Piazza Duomo; with bus stop nearby for day-trips out of Catania. Rooms with either private or shared bathrooms, wifi, parking spot, breakfast included. Hotel Nettuno, Viale Ruggero Di Lauria 121. Modern and spacious four star hotel on the beach of Catania with full facilities, including open air swimming pool, restaurants, health spa and full meeting facilities. Ideal for families as well as corporate.